Halloween is one of my favorite holidays. I used to love it because it’s a chance to get creative by making a costume. I have so many fond memories as a child going to a neighbor’s house for hot apple cider and donuts as a mid-point on our journey trick-or-treating from house to house. I also carried the tradition of dressing up even further into my adult life at Halloween parties or just at my/our house as we greeted the little ones. I used to dress up my grandma, too…she’d really scare the kids…did you ever see an old lady dressed up for Halloween, it’s somewhat freaky on its own, regardless of what they are (grandma loved it, though). I have always dressed Ms. Mae up as well. See below from last year…doesn’t she look thrilled. Another thing I love about Halloween is that it gives you a chance to be something you are not. In recent years, I’ve been a groupie, a sorceress, a dalmatian, a witch, Nanc.y Kerrig.an (because I’ve been told I look like her), a geek, etc. Most of these were couples costumes. My DH is also into it…one year he bought a fly mask and then crafted wings that were amazing. In the last few years, I have put less and less into it. 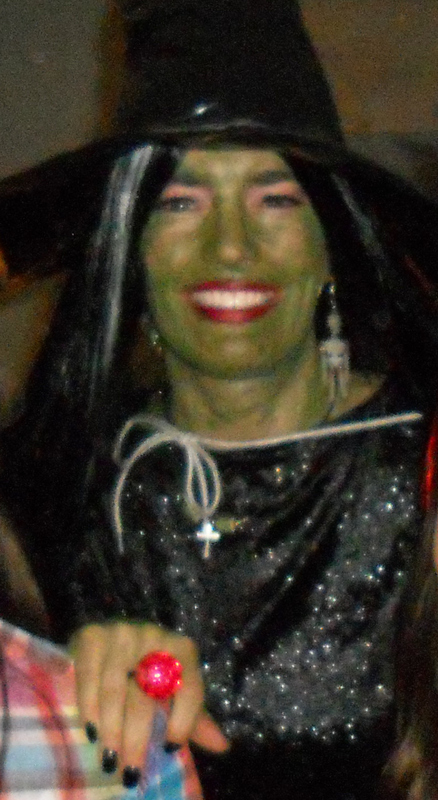 Here’s me in a basic witch costume from last year (don’t get scared…). The sad part is that I have nothing prepared for this year. We didn’t go to my friend’s party last night because we had tickets to a show. There were 25+ kids there and 15+ parents. For many reasons, this year I was happy to have an excuse. I didn’t see myself getting all decked out, being that cheery person I always seem to muster up to be at events like this. 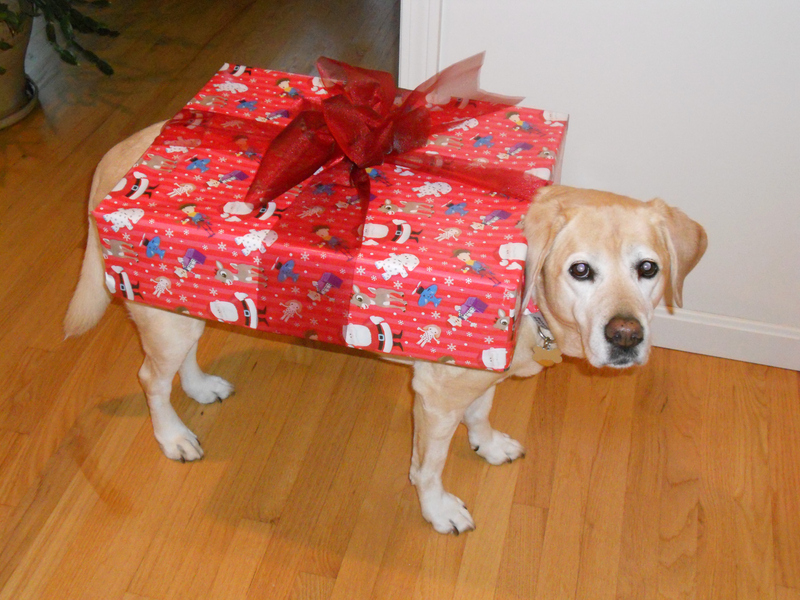 I don’t have anything for Miss Mae either this year. DH or I take her to see our former neighbor in her costume. This lady always got a kick out of my costumes for Daisy, so I figured we’d bring her back each year (it’s been about 3 now) for some treats. The lady loves it. So, tonight I found myself taking a white tee-shirt that I ripped in half down the middle for a rag and shoving it over her head through the arm saying, “now what can we do with this”. It looks like a little white cape on her. I was thinking of making her an old lady with a scarf on her head and glasses, but I feel bad making her wear anything that annoys her, being that she’s an old girl. Then I thought I’d make her head into a Daisy and tie a green scarf around her neck as a stem. Then I said, what the f am I doing this for. I’ve slowly but surely let IF and childlessness rip me apart, change me to something I’m not, make me something for Halloween. So, I guess I am dressing up tomorrow. I am the person that I wasn’t. I’m going to be a non-participator, non-fun making, non-creative person for Halloween. 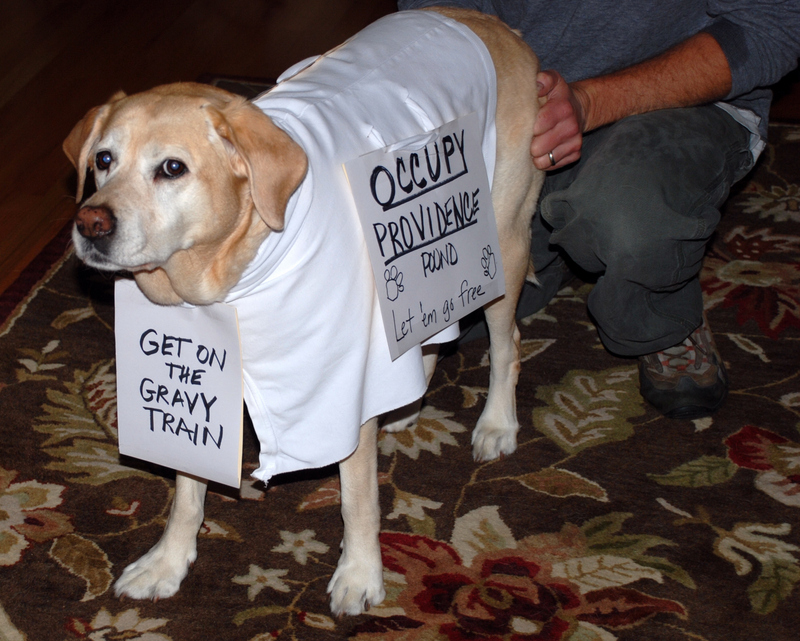 And, maybe Daisy will go to visit that lady with a lame-o tee-shirt on her and nothing else. I guess if I have to labor through another holiday without a reason to be happy, at least I can make that lady happy with a visit from the best doggie in the world! ETA…something popped into my head when I woke up this morning….Daisy in Protest (it’s somewhat of a local joke). 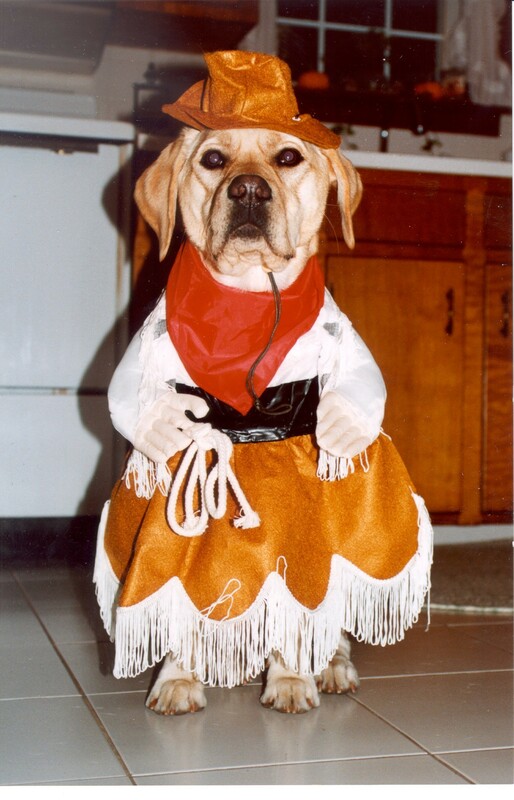 DH laughed and so didn’t that neighbor of mine….and Daisy hasn’t missed a year of dressing up. I am going to warn anyone reading this that this post is coming from a dark place. I have been doing OK overall, but I am sick of just surviving. I need a break. As soon as I say that, I worry that something else is just around the corner. I have become almost immune to bad news, to challenges, to the evil twists and turns in life. I am not going to say “why me”. However, I am saying that it’s time for something good to happen. My Mom started chemo last week. It was scary. I prayed for her as the drug went into her veins. Everything went OK, there were no bad reactions. We were there for almost 5 hrs. We played cards (Canasta) during the entire treatment. We took a break and had coffee and a snack. She seemed to handle everything well. They gave her a lot of different anti-nausea medications and they put her on dexamethasone (I had to explain how I knew about that steroid). She hasn’t started losing her hair yet, but that will come soon. She can’t go in crowds, so I’m doing errands for her, shopping, etc. I am happy to do it for her. Even in my state, I am writing her an inspirational poem, “When the Daffodils Bloom”. She should be done with her chemo and radiation by that time. Since my Mother’s diagnosis, I haven’t been focusing as much as I should on choosing an agency. I am so emotionally drained that I can’t focus. Unfortunately, I’m finding myself getting back into being the jealous, sad, bitter IFer. I don’t want to be that way. I don’t look at families on TV or in the mall or at gatherings and think that this will be us soon after we adopt. I think about how much I have to overcome to get there. I think of the loss of the biological connection. I think of all the nasty stuff. So many hurdles to jump. I read blogs of people in the process who have been waiting a long time for a match and I think that will be us. Because we CAN’T EVER GET A BREAK. Although I manage to do a lot, I walk around with the wind out of my sail and a heavy heart. I just want that freedom of happiness for a while. I know the negative is compounded due to my Mom’s diagnosis and relatively long road for treatment, but I assume this is normal. I have become that person that everyone looks at and compares themselves to, thinking, “thank God that hasn’t happened to me”. I’ve said this before. They say things like this make you a better person. I don’t want to be a better person, I want to be an average person who has a brood in tow and nothing serious to worry about. I guess I have to keep repeating this mantra.